The Torres Strait is an asset for the world’s life support system. But the region’s people are facing a number of serious challenges including rising sea levels, extreme weather and poor health outcomes. To foster the mobilisation of research knowledge, a group of Torres Strait Islander researchers commenced the “Meriba buay – ngalpan wakaythoemamay (We come together to share our thinking): Evaluating a Community of Practice for Torres Strait Islander Health and Well-being Project”. Our network explored the use of research and experiential knowledge with the help of our traditional Torres Strait Islander Elder and Cultural advisor/Storyteller and together we developed an arts-based performance. 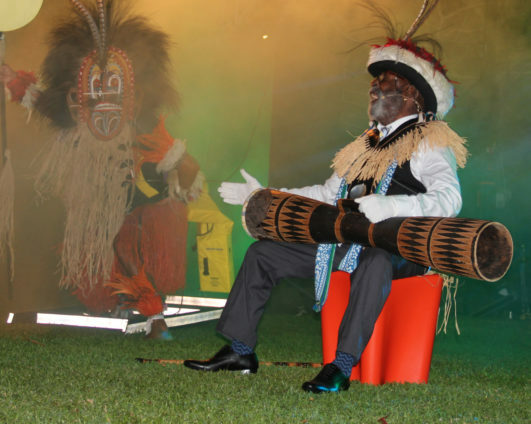 The scenario for the performance is… Woer Wayepa – “the water is rising”. It’s 2050 and a tidal surge has sunk the last of our Torres Strait Island homes beneath the depths of the rising sea. Culture clings to a lifebuoy… Is there anybody out there?